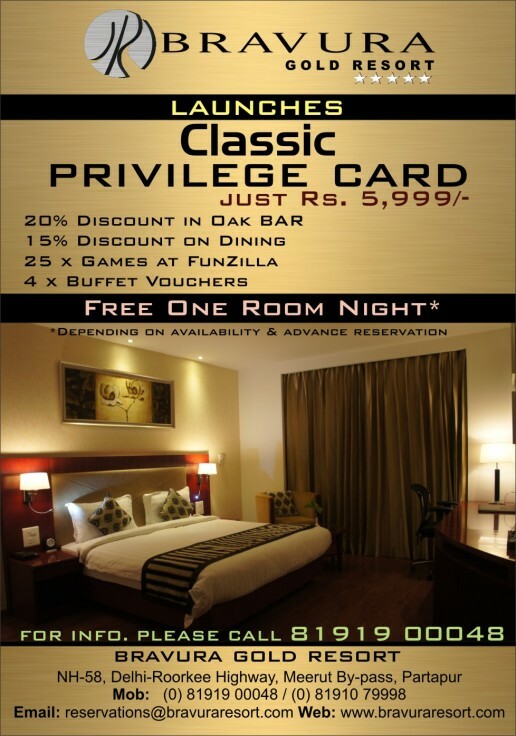 Bravura Gold Resort launches Classic Privilege Card just at Rs. 5,999/- with Free One Room Night stay and more discount options on other amenities like dinning, buffet, funzilla and oak bar. To know more details about Classic Privilege Card with new offers just at Rs. 5,999/- at Bravura Gold Resort, kindly send us your request using our Enquiry Form and we will contact you at your convenience. Alternatively, you can also email us directly at reservations@bravuraresort.com or call us at +91-121-7196655, +91-8191079998, 8191900048.